Tapestry bobbins have a mystique around them and they can be expensive. 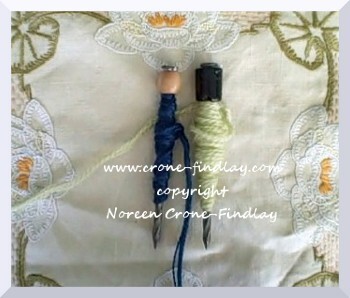 But, what do you do if you need a lot of tapestry bobbins and have a limited budget? First you analyse, then you upcycle! After all… a tapestry bobbin is a yarn delivery device. It needs to hold yarn in a way that allows you to pass it through a fairly small shed. 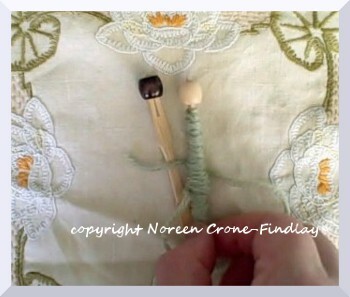 It should have a tip that will allow you to tap your weft yarn into place. It needs to be able to hang from the tapestry while it’s parked. So…. there are things that will work quite nicely for you as you feed your piggybank, but weave your tapestries in the meantime. 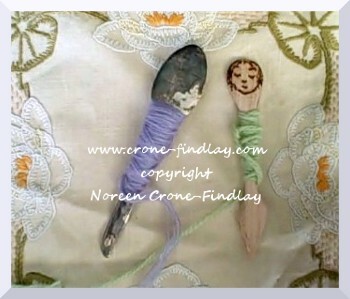 would a little coffee spoon work as a tapestry bobbin? So, I took a little orphaned silver coffee spoon that had been in a box of sandbox toys that I bought for my grandson at a garage sale, and hammered the poor thing flat. 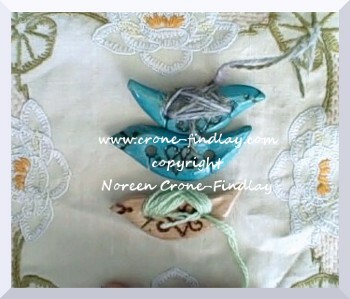 It works BEAUTIFULLY as a tapestry bobbin! This made me think…. hmmm…. metal spoon…. hmmmm…. ~metal bobbins~…. hmmmmmm…. So, what about a 4 inch nail with a bead on the end? Would that work? Yup. Wash it well first, and if the tip is snaggy, sand it smooth or file with a nail file. You could paint it if you want, or coat it with a clear gel just to ensure that it won’t discolor your yarn. Stuff a bit of tissue into the opening of the bead to secure it. 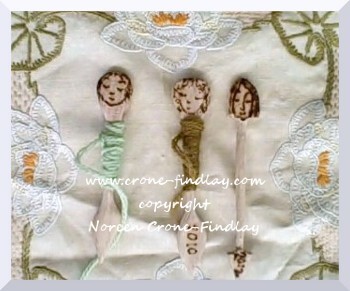 I learned about using bamboo forks as bobbins on Ravelry. But, I have found that they work much better if you stick a bead on the end. Squish the tines of the fork into the bead center and you’re set to weave. I love tatting, and used to carve tatting shuttles. 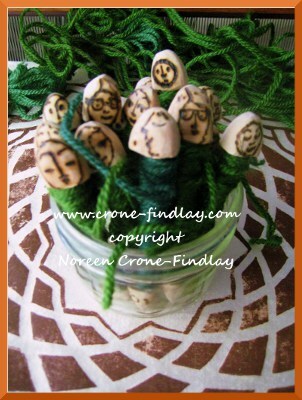 So, be creative and think outside the box when you are contemplating tapestry bobbins. I mean, really… spoons and forks? If you are willing to experiment, you’ll find all kinds of things that will work really well in your weaving! Clever little duck, aren’t you!